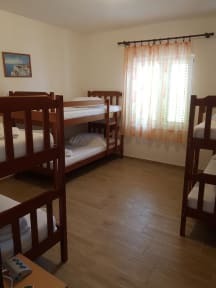 Luka's Lodge i Hvar, Kroatien : Boka nu! 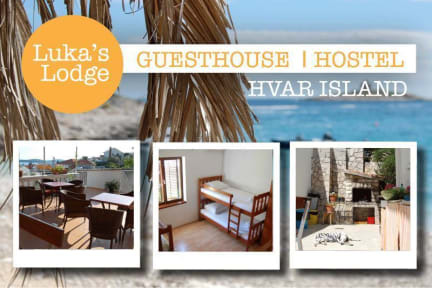 Luka's Lodge is one of the longest running and best hostels in Hvar! The owner, Luka was born and raised right here and has all the inside tips for exploring this beautiful island. Luka's Lodge is more than just a hostel, we pride ourselves on making you feel at home, you won't want to leave! We are located a short 5 minute stroll from the town centre and the closest beach is 2 minutes away. Our terrace has stunning views of the ocean, Carpe Diem island and the Pakleni islands! We offer spacious, clean dorms and private rooms with ensuite and shared bathrooms. All rooms have access to fridges, lockable storage, air conditioning and hairdryers. bedding, towels and breakfast (freshly made pancakes) is all included in your stay! Luka's Lodge has everything you would want from an island hostel. We have a fully equipped kitchen, common areas where you can soak up the sun or nice shady spots to chill out in. Board games and cards are available for when the hangover is to much and there is a book exchange as well. We have Wifi throughout the whole hostel and a laundry service too. You can rent scooters and bikes to explore the other equally stunning towns, riding through olive trees and fields of lavender, or hire a boat and discover secret beaches on the Pakleni Islands. We can organise day trips to the Blue and Green caves and come night time the partying begins!! We are known for our family dinner nights; be it a BBQ, burger or sangria night there is always something happening. Come 10.30 we hit the bars and show you all the best places to drink and dance! We love Hvar and we know you will too! One of the best hostels I’ve stayed at in terms of atmosphere. Met some great people here. Friendly staff. Not the biggest lockers if you have a big bag, hard to fit. Only downside for me is that the kitchen could get an upgrade especially regarding the knives, at least a knife sharpener would be nice. Dull blades is dangerous to use when cooking. Would definitely recommend! I stayed for five nights at Luka's Lodge but I really wish I could stay longer because of the great people I met, both employees and guests were amazing. Our stay became a great mixture between cozy dinners and long nights in the harbour. Everything, both the Island and the hostel, was really really good. Close both to the harbour and city life, as well as to different small beaches or the taxi boats that can take you to other Islands nearby. Stay here!! Stayed in a double bed apartment. Overall very happy and would definitely come back. Luka and his staff are really kind people! Our room wasn't ready until 2h after check-in though, but we enjoyed our stay anyways.